And we’re off! The kitchen renovation planning is full steam ahead. HandyMan and I have spent the last two weeks checking out appliances. We received great quotes from Tasco and Appliance Canada. Both places were willing to price match and offered the same appliances so I did a bit more comparison, checked out online reviews, and ultimately we decided to buy from Appliance Canada. Appliance Canada was a bit more direct, no sales BS to go through while Tasco offered great product knowledge. If you’re in the market to buy, I recommend both these retailers as we had friendly service from each. So what did we get??? This baby boasts gas burners and an electric convection oven. We had considered a model with a gas convection oven, but Home Depot guy Chris told us that electric convection ovens are better for baking and slowly cooking foods at a lower temperature. Since the idea of an inconsistent gas flame in my oven bothers me and I've been known to make a batch or two of molten chocolate cakes in my time, we went with electric. This is a slide in model so the vent is at the side of the oven door as opposed to the back. It also features child safety locks as the controls are at the front (not that we'll be needing those just yet ;) ). One great little feature is the reversible grate on the front burner. It has little prongs which are perfect for holding a wok in place. We briefly considered buying a Miele dishwasher. The Tasco salesman made some great points: Miele invented the dishwasher, the model we looked at had a food catcher and no visible element (if you've ever melted a piece of tupperware like I have, you know that's a good thing! ), and it used signficantly less water than the KitchenAid. Upon inspection though, a very simple but important item pushed us to KitchenAid -- some of my dishes are curved and only the KitchenAid offered a layout that would fit them! TIP: if you're at all concerned, bring a piece of your dishware to the showroom. Its easy to get swayed by the shiny stainless interior and fancy buttons and forget about functionality! The controls on this model are on the front though newer models have the controls hidden. Again, there are child safety locks so not a concern for us to get the more expensive hidden controls. Panasonic's "inverter" technology is apparently the best on the market. Old-style microwaves use 'linear delivery' - they are either putting out microwaves or they're not. So, if you want to heat something up at 60% power, this means that the microwaves are put out only 60% of the time the machine is on. That's why you will often hear your microwave "pulsing". 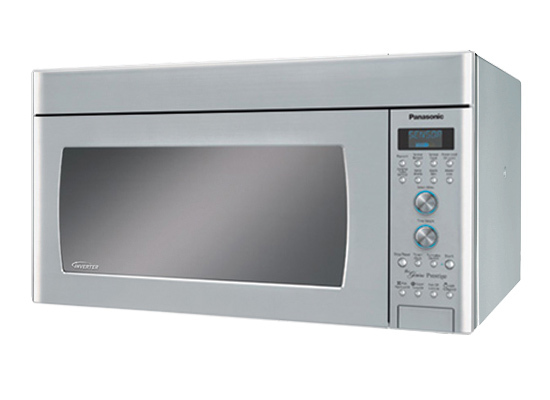 With inverter technology, the microwave is able to put out a consistent level of microwave energy. What does all this techno-speak really mean? Well, it means that food can simmer and won't overcook. Yay, no more chicken pot pies that are burnt on the crust and ice cold inside! So now that we've got the appliances, we just have to settle on a cabinet manufacturer. We've got a few appointments lined up this week so will blog about those results soon. I came across your post when I did a google search for the Panasonic NNSD297S. It's the OTC M/W that we are currently considering but we're reluctant because I've heard that it's not vented to the outside & therefore doesn't get rid of smoke & smells very well. What is your experience with it? Would you recommend it to others?